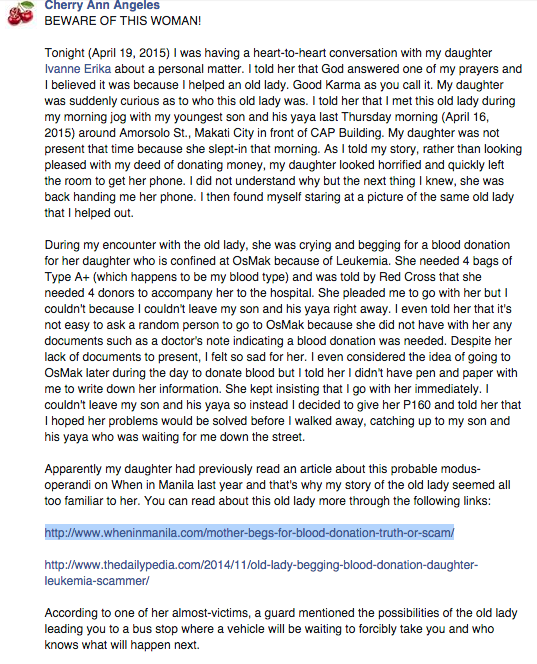 A while back, we posted a story on an elderly woman approaching strangers and asking for blood donations for her sick daughter, with other netizens exposing it as a possible scam. It seems like this “blood donation” lady strikes again, according to a recent post that has been circulating on Facebook, by a certain Cherry Ann Angeles. According to the post, the netizen was having a heart-to-heart talk with her daughter, where she felt that God had answered her prayers because she helped an old woman. As her daughter was curious as to who this old lady was, instead of looking pleased with her mother’s good deed, she quickly got her phone and showed the photo of the old lady from our previous post. It was then that the mother realized that this was the same old lady she helped earlier. Instead of tagging along with the old woman, she resorted to giving her P160 as help and wished the old woman well, before catching up with her son and the nanny. This is a post that strikes pretty close to home, as I, too, have had a personal encounter with this old lady. This happened five years ago, in 2010, in the University of the Philippines Diliman. I was with my blockmates, and we were all freshmen at the time, standing by the steps of Palma Hall, one of UP’s main buildings quite early in the morning. We were readying ourselves for a fun run we were required to participate in for our PE class, when this same old lady approached us, begging and crying. She said that she had been walking around Quezon City the entire day looking for blood donors, as her child, supposedly leukemia-stricken, was confined in East Avenue Medical Center. As we were in a pretty large group, she said that she needed about 4 blood donors for her child, and that she was desperate because she did not have any money. We advised her to go to PGH, but she said that even the fees in PGH were too exorbitant for a poor woman like her. Being the do-gooders we were, we resorted to giving her money, instead of coming along with her like she had asked. We gathered about P2,000 before wishing the woman well. She cried and thanked us profusely, before finally leaving us alone. It is difficult to come to conclusions, but it is quite a sorry sight that this has been going around for quite some time. What do you think of this? Have you encountered this old woman before? Krazy Garlik 40 Kloves Chicken at Half Price Every Wednesday!